The Blog Argentine Sea Trout angling at its finest! Argentine Sea Trout angling at its finest! A very excellent 2019 season at El Rincon has come to a close. Interest for next year is building and many weeks have already filled with repeat guests. If you’re looking for a sea trout experience surely among the best in the world, NOW is the time to secure your spot for the 2020 season. Grab the chance for an unforgettable, yet affordable, fishing memory to last a lifetime! Imagine yourself in wild Patagonia… After a hearty and delicious breakfast, your only trouble is deciding where to go fishing that day! Our El Rincon program has access to over 50km of private, double bank water, shared in rotation with ONLY five other rods. This reach of Rio Gallegos is regarded as the river’s most scenic and inviting — with a significant run of fully wild sea trout and a robust population of masive resident browns. We will offer this unique fishery to ONLY six rods weekly from January through mid-March. Fly fishing for fresh run sea trout & resident brown trout in the province of Santa Cruz, Southern Patagonia, Argentina, the most famous sea trout destination in the world. The Estancia El Rincon covers some 57,000 acres and incorporated within its private boundaries we have a 20km stretch of the world renown Rio Gallegos and a further 35kms of its major tributary, the Rio Penitente, a spectacular river in its own right where more than 50% of the total Rio Gallegos run are heading. Though this can be described as a true wilderness experience, the lodge is very comfortable & retains all its original features and historic charm, having been built in this remote part of Patagonia in 1902. With the river just some 150 metres from the house, guests have spectacular views of the surrounding landscape together with the Andes as a panoramic backdrop. The El Rincon fly fishing programme is a true “El Campo” style operation run from Estancia Rincon De Los Morros, Southern Patagonia, some 1 hour an 40 minutes drive from the town of Rio Gallegos. The Estancia owns exclusive private access to 20 kilometres of the world famous river, the Rio Gallegos, which enjoys strong runs of sea trout all through the season. In addition there is a further 35 kilometres of private double bank fishing on the picturesque Rio Penitente which also has large runs of sea trout plus a very healthy stock of indigenous brown trout running up into double figures. The lodge retains all the character and charm of its original turn of the century roots, having been imported from England in 1902 and completed in 1906. It stands on the banks of the beautiful Penitente river with uninterrupted views over the surrounding countryside, together with the Andes mountains as a panoramic backdrop. All of this can be enjoyed from the comfortable and expansive lounge area within the lodge complete with open log fire. All guests bedroom accommodation is based on single occupancy unless couples wish to share. All meals and drinks, including alcoholic beverages are included in the price. The fishing at El Rincon is for both fresh run sea trout up to 20+lbs and also for resident brown trout averaging 3 to 4 lbs but with many large specimens up into double figures. 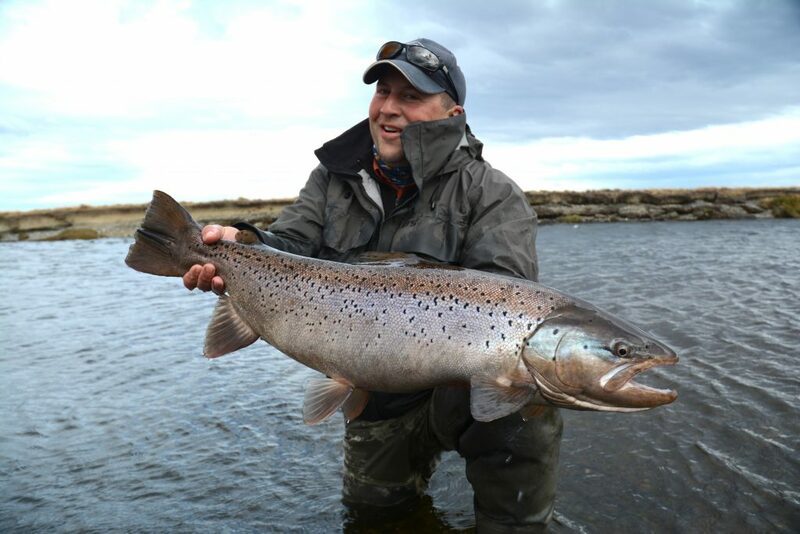 The main runs of sea trout make their way into the river system around the end of November beginning of December and continue with strong runs all the way through the season until the end of April and beyond, with guests having total access to our fishings on both the Rio Gallegos and the Rio Penitente during their stay. The Rio Penitente: Our 35 kilometres of the Rio Penitente is just a short distance from the lodge so guests have the opportunity to pick up a rod and walk the few steps across the garden to try a few casts in any of the home pools of this stunningly pretty river. The Rio Gallegos: Our privately owned double bank section of the Rio Gallegos is a short drive from the lodge. Along these 20 kilometres we have a selection of classic looking pools holding good numbers of migrating sea trout. Brown trout are also here but usually we are concentrating our efforts on the sea trout populating the river on their migration upstream. These fish are big……….and angry at having their journey interrupted, so be prepared for some rod bending action when encountering one of these hard fighting chromers! Our expert guides use 4×4 vehicles to transport guests to different sections of the river each day but because of the meandering nature of the river and its myriad of glides, streams, pots and deep cut channels, time is never wasted driving long distances, as it is easy to walk from pool to pool in any chosen area. The fishing package at Rincon consists of 6 full days fishing/ 7 nights accommodation based on single occupancy. Inclusive of transfers to and from the local airport. Two anglers per guide. All meals, drinks (including alcoholic) are included within the price. (International and Internal flights not included). For 2020 season the price will be $4650 USD per person per week, so the financial hurdle is significantly lower than most other equivalent packages available. Plainly said, this is a good deal for very good fishing. The management team at El Rincon consists of Diego Peralta and Paul Becher. Both are passionate fly fishermen. Diego was born and raised in Rio Gallegos and has fished the local rivers all his life. He knows them intimately. Paul has fished extensively around the world, but has always been drawn back to Patagonia. The permanent guide team are professional local fishing guides Luciano Arata, Fedrico Quintero and Diego Peralta. Our experienced and hard working team at El Rincon will make sure you feel at home in the one of the most astonishing Sea trout fisheries you can find. Each member of our small crew knows their job extremely well and all are an important cog in a well-oiled and very cosy package. We pride ourselves in running a highly efficient but totally relaxed program catering to all tastes and with the diversity of our river systems, no matter what the conditions, good fishing can always be found. Be sure you are one of the fortunate few to fish with us at El Rincon in 2020!